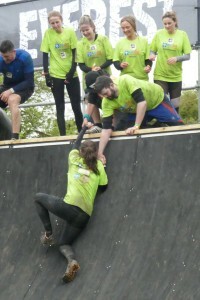 Home > KidsOut News > KidsOut takes on Tough Mudder! 10-12 miles. 20+ obstacles. Blood. Sweat. Probably a few tears. But mostly LOTS and LOTS of mud! This is what awaits the 12 brave (or crazy?) KidsOut staff members (+ friends and family) taking on the Tough Mudder challenge on Saturday 4th May. Tough Mudder is one of the toughest events on the planet. Designed to test every aspect of your physical and mental strength, grit, and determination, the Tough Mudder is feared by even the keenest gym-goers. The 10-12 mile course is interspersed with obstacles nobody can overcome alone, so teamwork is paramount to success. So…why on earth are we putting ourselves through this?! The children KidsOut supports have experienced things we would never wish upon a child, much less a member of our family, things that no child should ever have to witness. KidsOut provide these children with a fun, happy memory just like my own childhood memories. Our Fun Days allow children to let go of worry and fear, and have fun, just as children should do. It is important to remember that a Fun Day is so much more than just a trip to the seaside, or the cinema or a bowling trip. It teaches children what it’s like to have fun and happy memories again, lets them know that people care, rebuilds confidence, and gives them something to talk about with their peers to hopefully reduce their feeling of isolation. Donating just £20 can really help to change a child’s life by providing a day out for a disadvantaged child. Please follow the link below and donate whatever you can.